The Trump Card of All Affirmations! – Love Yourself To LIFE! The Trump Card of All Affirmations! Check Out The Affirmation Audio Below! Affirmations, affirmations, affirmations! I know! I bang on about them a lot because they work! When you’re healing yourself naturally from bipolar disorder and cancer and you’re building an online business for the first time ever, affirmations and creating supporting self beliefs can be a major positive player in your game. Affirmations are powerful life nurturing statements used on repeat to re-write the thoughts and beliefs that we hold in our subconscious mind. The ‘programmed’ thoughts and beliefs in our subconscious minds direct the choices we make and how we live and experience our lives. It’s our beliefs that have power over us so getting to work reprogramming the negative ones is essential if you want to live a happier, healthier more fulfilling life. Reprogramming starts with deliberately choosing and thinking new life nourishing thoughts which will eventually become ingrained beliefs. After all, a belief is just a thought that has been thought over and over again. If you’re anything like me you’ve tried hundreds of affirmations, to change your beliefs, some stick, some don’t. It’s easy to jump from one to another. There are some affirmations that I love and are so deeply ingrained in me now, that I will continue to think them on and off for the rest of my days. But often I find new affirmations and then I forget about them as I discover something else! My focus gets dispersed. What’s needed is a magic formula that covers everything; health, relationships, well-being, finances, capabilities – A Super Affirmation! This affirmation originally came from the work of Emile Coue, a French physician from the late 1800’s. Coue experimented with many different affirmations, and ways of using them, and he gave them to his patients to use to aid their own healing and to help them develop new beliefs to help them get better and better. Those patients that did indeed practice the affirmations healed more quickly than those who didn’t. I first came across this affirmation through the work of Jose Silva back in 2006. Jose Silva has used this affirmation in his mind programming methods for a long time, with success. Take a look on Google or YouTube and you’ll find hundreds of people sharing their experiences of how much this affirmation has helped them rewrite their negative beliefs, in many different powerful ways. The only people who have anything negative to say about it are the people who haven’t actually done it! The only time affirmations don’t work is when you don’t practice them. 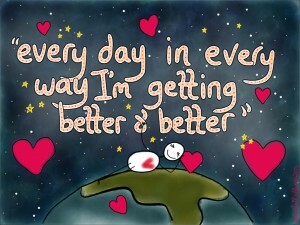 Even though I loved this ‘better and better‘ affirmation when I first discovered it, I didn’t actually practice it. Guilty! The biggest proof of all is in our own practicing and testing out of something. Nothing shows us better than the results we get for ourselves. Affirmations only work if you do them! I know this is the most obvious statement in the world, but you’d be surprised! They are supposed to be practiced with consistency on a regular basis. We can’t rewrite our beliefs without regular repetition, unless we’re under hypnosis or something similar! I’m making this point because I am super guilty of claiming that things don’t work, even though I haven’t practiced them fully enough. So if you’re interested in using affirmations to rewrite your beliefs and get you feeling better and better commit to practicing it for a certain amount of time where you can actually take a look at your life and see if you can recognise the changes the practice brings. So How Do I Practice This Affirmation? Well, I’m only starting this new way of re writing my beliefs starting from today, and I’m doing it as an experiment, and when I am inspired by the results I will continue adding it to my daily regime of self love, so that I can continue to get better and better in every way. So I can’t report on it’s impact yet, but I will. I have also made an audio of me repeating it (with some nice background music) so I can plug in and listen to it when I’m up to other tasks. The reason I like taking affirmations in through audios is because I know I am an auditory person. This goes as far back as when I was at primary school and if whenever we would be having a test I would record all the answers onto my little 1980’s tape recorder and listen to it as I was falling asleep. Then I’d know all the answers to the test! So, it works for me. I’m sharing that audio for your pleasure if you wish to listen to it. Would you like to feel more capable? 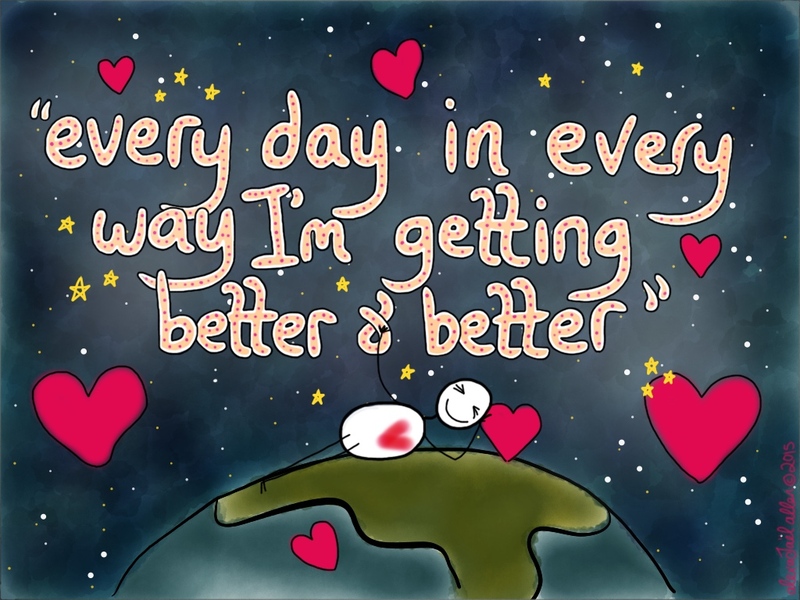 Would you like to experience everything in your life getting gradually better and better and better? Then I challenge you to practice this affirmation. Try it for 2 weeks. I‘m doing it for 2 weeks as from today and I’ll report back the changes I’m noticing in 2 weeks time, and ongoing! P.s – Hey! Want to learn how I create passive income streams through using my creativity on the internet? Click the ‘Laptop Lifestyle’ banner below and sign up for our FREE Video Bootcamp Series to access our education. Thanks for sharing this wonderful affirmation. Just need a clarification though. Does this master affirmation works if I want to become a pilot? Meaning ” Every day in every way I am becoming better and better ” would it bring me to my ambition?